Dr. Scott Shamblott is a general dentist and the founder of Shamblott Family Dentistry. Dr. Shamblott earned his Doctor of Dental Surgery (DDS) degree, awarded with high distinction, from the University of Minnesota. Dr. Shamblott also attended the Medical College of Georgia where he studied IV sedation techniques, as well as the Las Vegas Institute for Advanced Dental Studies, where he studied sleep apnea and sleep apnea treatment modalities. He also completed orthodontic training at Faculte for Orthodontic Research and Continuing Education and additional orthodontic training at Six Month Smiles. 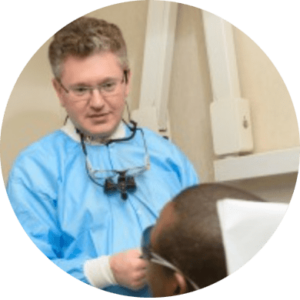 Dr. Shamblott’s many certifications include a fellowship in the Dental Organization for Conscious Sedation and the Academy of General Dentistry, as well as certification in Advanced Cardiac Life Support. He also earned a Conscious Sedation Permit from the Minnesota State Board of Dentistry. My goal is to make it as easy as possible for everyone to go to the dentist, said Dr. Shamblott. Whether you’re afraid of going to the dentist, have had a bad dental experience, or simply need someone who can communicate well with you about your treatment, my goal is to make Shamblott Family Dentistry a warm, inviting place for people of all ages to receive excellent dental care. Dr. Shamblott is married to Kate, and they have one daughter, Rachel. Rachel makes frequent appearances with her dad on television, radio and video, helping her father connect and communicate with children and teens about their dental health. Dr. Shamblott makes frequent television and radio appearances and is an often-quoted expert on issues pertaining to dental health. He makes his home in Plymouth and enjoys spending time with his family when not at Shamblott Family Dentistry. Summary of Credentials: Dr. Scott Shamblott, D.D.S., F.A.G.D., F.D.O.C.S. To make an appointment with Dr. Shamblott, please call Shamblott Family Dentistry at 952-935-5599 today. Remember, new patients receive their new patient examination and necessary X-rays (bitewing and panoramic) free!